WHAT: An Adam Experiment: A one-man play on the life of Adam Clayton Powell, Jr.
PRICE: $25 • $15 (Students/Educators). Additional service fees may apply. 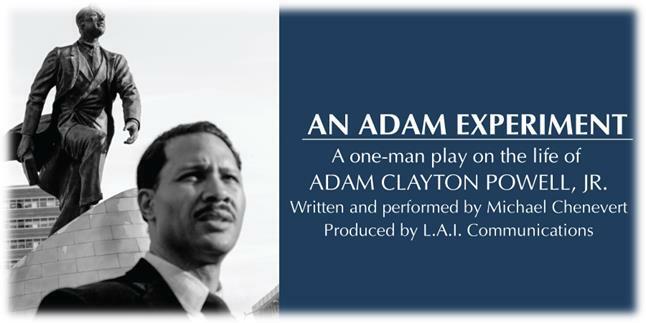 INFO: An Adam Experiment is a one-man play that explores a day in the life of Adam Clayton Powell, Jr., a pioneering crusader for justice during the Civil Rights movement and member of the U.S. House of Representatives. This play touches on Adam’s fight for equality for African Americans as well as struggles in his personal life. Adam Clayton Powell, Jr. comes to life through the incredible performance by Michael Chenevert and focuses on a specific day where he is dealing with an angry country due to integration and his wife confronting him about the future of their marriage. CINCINNATI, OH – In celebration of Black History Month, the Cincinnati Arts Association (CAA) is pleased to present An Adam Experiment: A one-man play on the life of Adam Clayton Powell at the Aronoff Center’s intimate Jarson-Kaplan Theater on Friday, March 1, 2019 at 7:30 PM. Written by and starring New York based actor, Michael Chenevert, An Adam Experiment explores the day in the life of Adam Clayton Powell, Jr., a pioneering crusader for justice and equality during the Civil Rights movement. The show is part of CAA’s 2018-19 Presenting Season. Tickets are $25 for Adults and $15 for Students/Educators and are on sale now at www.CincinnatiArts.org, (513) 621-ARTS , and the Aronoff Center Ticket Office. Produced by L.A.I. Communications, the U.S. Tour of An Adam Experiment is celebrating Black History Month with a ‘play for the people’ by presenting a comprehensive program for the communities where the play will be performed that not only entertains, but also educates and empowers audiences. On stage, An Adam Experiment educates audiences on Adam Clayton Powell, Jr., who was a Baptist Minister at the famed Abyssinian Baptist Church in New York City and a Member of the U.S. House of Representatives, representing Harlem, New York, from 1945 to 1971. By 1961, Mr. Powell was appointed to the powerful position of Chairman of the Education and Labor Committee and was one of the influential voices in the passing of significant social and civil rights legislation under Presidents John F. Kennedy and Lyndon B. Johnson. An Adam Experiment takes this political backdrop and creatively delves into Mr. Powell’s life where he is dealing with an angry country due to integration as well as with personal challenges with his marriage. After each performance, audience members will have a chance to do a Q&A with Mr. Chenevert and discuss the play, as well as its parallels with social justice issues facing our society today. In each local community, from high schools and universities to other service-based organizations, the ‘An Adam Experiment’ Producer-in-Residency program is complementing each performance. The Producer-in-Residency program presents a unique method of exposing young people to the “behind the scenes” and business of producing a play and teaching them how it also parallels with entrepreneurship and the skills that it takes to be an entrepreneur. In Cincinnati, five Producer-in-Residency workshops are scheduled in middle schools and high schools on February 26-27 and March 1. In addition, CAA is presenting two daytime performances of the show at the Aronoff Center on February 28 for students as part of its SchoolTime education program. Originally, from Detroit, Michigan, Michael Chenevert is a well-trained and multifaceted actor who works on stage, TV, and film. He studied at the University of Detroit Mercy where he received his Bachelor of Fine Arts degree. Over the course of his career, Mr. Chenevert has worked at the New Federal Theatre, The Billie Holiday Theatre, Take Wing and Soar, The National Black Theater, Arkansas Repertory Theatre, Cincinnati Playhouse in the Park, and The Public Theater. His film credits include: Syrup, Soul Mates, The Tombs, Eugenia and John, Soil, and The Breathing Room. Mr. Chenevert’s TV credits include: The Following, Boardwalk Empire, Ugly Betty, Guiding Light, One Life to Live, and Final Appeal. Originally from Cincinnati, Ohio, Tyrha M. Lindsey-Warren is an experienced Producer and Marketing Executive who has worked for Quincy Jones*David Salzman Entertainment, NBC, Creative Artists Agency, Edmonds Entertainment, Alvin Ailey American Dance Theater, and advertising agency, UniWorld Group. She has assisted in overseeing the production of such programs as MAD TV (FOX), In the House (UPN), Lost on Earth (USA) and VIBE (syndication). She is currently producing the motion picture Tryin’ To Sleep in the Bed You Made, based on The New York Times bestselling novel of the same name. Ms. Lindsey-Warren is also on the producing team for the International Faith and Family Film Festival at MegaFest. As an entrepreneur, Ms. Lindsey-Warren heads her family’s award-winning marketing and public relations agency, L.A.I. Communications, which is “dedicated to delivering EMPOWERING communications.” The firm specializes in creating strategic marketing and communications solutions, with a focus on cross-cultural themes, for media companies, corporations, arts institutions, non-profits, and small businesses.